Westerpark West is a residential development in the west of Amsterdam which will transform the former grounds of a commercial bank into a lively residential neighbourhood. The site draws from a rich industrial history and its unique position within Amsterdam’s green network and waterscape. 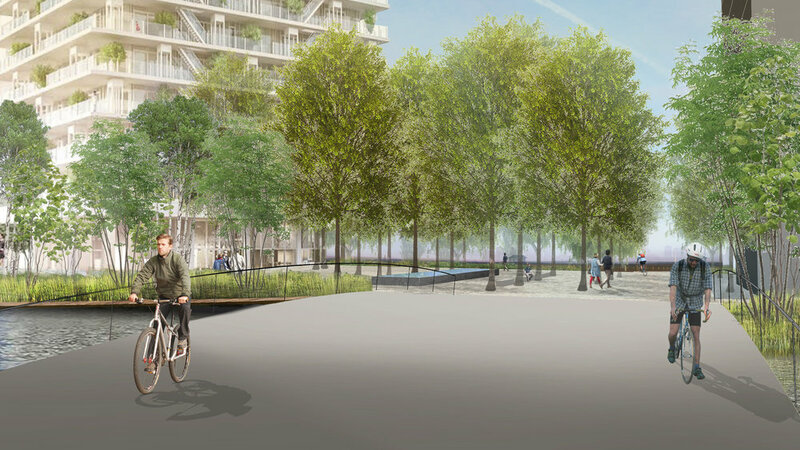 Working in collaboration with MVRDV, our landscape design promotes a healthy living environment and encourages a culturally diverse neighbourhood through the incorporation of extensive community spaces and a 450m long public promenade along the Haarlemmer Canal. Utilising historic, industrial links and landscape elements to create a strong contextual, framework, our design improves permeability and pedestrian links between buildings and the surrounding areas and works to define individual landscape characters within each building plot which adapt to the needs of both, the residents and the local community. The planting concept for this project takes inspiration from the carefully curated Heemparks in the west, combining these picturesque elements with extensive areas of native and biodiverse planting. Furthermore, our design creates an accessible public realm and a gateway to the wider Westerpark area; Encourages a multitude of public realm typologies adapting to the needs of residents and community; Breaks down existing barriers and creating a public promenade and boardwalk along the canal to allow access to the water; and combines picturesque planting elements with extensive areas of native planting.